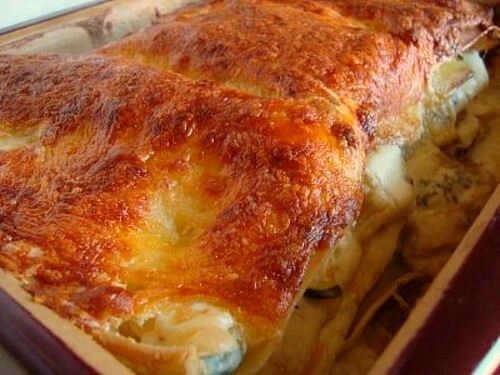 - In a baking dish, spread 1-2 tablespoons of prepared alfredo sauce. - Place a layer of 3 dry lasagna pasta sheets. - Top with half of the chicken, squash, zucchini and mushrooms. - Sprinkle with half of the cheeses. - Place another layer of 3 dry lasagna pasta sheets. - Spread enough prepared alfredo sauce over pasta sheets to cover. - Top with remaining chicken, squash, zucchini and mushrooms. - Sprinkle with half of the remaining cheeses. - Place top layer of 3 dry lasagna pasta sheets. - Sprinkle with remaining cheeses. - Bake in preheated oven for 45-50 minutes until pasta is cooked and cheese is golden brown & bubbly. Great recipe - thanks for sharing! It looks mighty tasty! I love a good "white" lasagna. This looks wonderful! I think "white" lasagna is so underrated! This sounds delicious. I have never made a lasagna with white sauce but it sounds like I need to! I'm a huge fan of veggie lasagna. Very good. That looks excellent! Thanks for sharing. I love this idea. It looks so good! I'm going to have to give this one a try. I've actually never made a white lasagna so this will be the first! This looks great. I love vegetable lasagnas. Good way to use up your leftovers! Mmmm this looks and sounds so creamy and delicious! Yum! It's funny how the best-tasting things can be the stuff that uses up the leftovers from the fridge! How many pounds was your chicken breast and how did you cook it to incorporate it into this dish.